As featured on BBC News - WWII Spitfire Pilot Mary Ellis from Isle of Wight turns 100. You'll be £11.99 closer to your next £10.00 credit when you purchase A Spitfire Girl. What's this? We visualise dashing and daring young men as the epitome of the pilots of the Second World War, yet amongst that elite corps was one person who flew no less than 400 Spitfires and seventy-six different types of aircraft and that person was Mary Wilkins. Her story is one of the most remarkable and endearing of the war, as this young woman, serving as a ferry pilot with the Air Transport Auxiliary, transported aircraft for the RAF, including fast fighter planes and huge four-engine bombers. On one occasion Mary delivered a Wellington bomber to an airfield, and as she climbed out of the aircraft the RAF ground crew ran over to her and demanded to know where the pilot was! Mary said simply: I am the pilot! Unconvinced the men searched the aircraft before they realised a young woman had indeed flown the bomber all by herself. After the war she accepted a secondment to the RAF, being chosen as one of the first pilots, and one of only three women, to take the controls of the new Meteor fast jet. By 1950 the farmer's daughter from Oxfordshire with a natural instinct to fly became Europe's first female air commandant. In this authorised biography the woman who says she kept in the background during her ATA years and left all the glamour of publicity to her colleagues, finally reveals all about her action-packed career which spans almost a century of aviation, and her love for the skies which, even in her nineties, never falters. She says: I am passionate for anything fast and furious. I always have been since the age of three and I always knew I would fly. The day I stepped into a Spitfire was a complete joy and it was the most natural thing in the world for me. A remarkably vivid account of a passion for flying and its fulfillment in the service of the Air Transport Auxiliary. This is the remarkable story of a woman who was born to fly. Someone once said "There are no extraordinary people: only ordinary people who have done extraordinary things". I thoroughly recommend you read this book and see if you agree. ... This is a lovely book, and such a refreshing change to be able to read such 'ripping yarns' about a young girl pilot instead of the usual archetypal swashbuckling and testosterone-fuelled fighter boy. It is highly recommended. Mary supplies photographs of time long ago when she was the happiest standing with flying colleagues, and tells about her hit and miss of flying from the first time she enters the cockpit to the time she hangs up her propellers. Her life story was the need for flying so was it such a shock) that she thrived for speed, which is why she got into car racing, which shouldn't be a surprise. I'm not going to reveal anymore about Mary's life adventures, so if you enjoy the thrill of speed and soaring in the air I would recommend you read this book of this woman who really had lived. This book recounts one woman's experiences as a wartime female pilot. It describes how she became interested in flying while very young, and how at school in her teens she was able to go for flying lessons insteadvof playing hockey ! Having qualified as a pilot she thought she would have to give up flying for the duration of the war ; but then she heard an appeal for women pilots for the Air Transport Auxiliary in the autumn of 1941. Mary describes her training for the ATA, her first flight in a Spitfire, and the perils an excitement which arose from flying many different types of aircraft. She includes tales of the amusing and sad events during those years, and of the sometimes-hostile , sometimes- incredulous behaviour she experienced from the men she encountered during her work. And she speaks of other pilots she knew. Marys post-war life is also covered. She flew the Gloster Meteor , took up rally driving, and became the Commandant of Sandown (isle of wight) Airport. In recent years, she has gained a degree of celebrity status as one of the few remaining ATA women pilots. The book also includes a comprehensive list of the aircraft she flew , and the airfields she served. 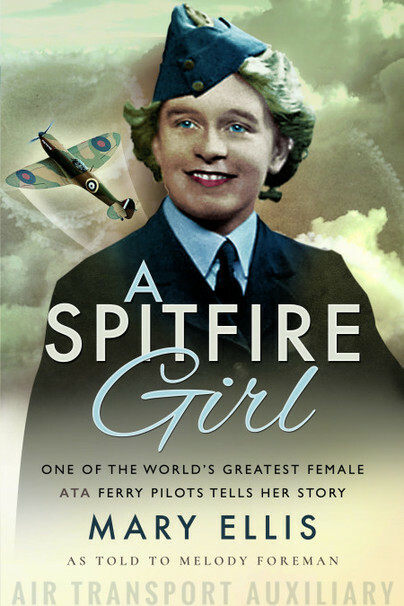 'A Spitfire Girl ; Mary Ellis - one of the worlds greatest female ferry pilots as told to Melody Foreman ' is a valuable addition to the non- fiction books about the Air Transport Auxiliary . Melody Foreman is a qualified journalist and graduate with experience in newspapers and television documentaries. She is the author of the best-selling 'Bomber Girls' and has also written two books about the history of Kent. Melody is a contributor to Britain at War Magazine. She maintains an avid interest in the Air Transport Auxiliary, the social history and reportage of both world wars, vintage aviation, film studies, literature and Dutch art.